Preventative refrigeration maintenance doesn’t seem like a topic to be talking about right now, but any time of year is a good time to keep your refrigeration units in top running condition. After all, you don’t want to be wasting money on higher utility bills because your refrigeration units and cooling systems aren’t operating efficiently. If you haven’t thought about preventative refrigeration maintenance before, now’s a good time to talk with the refrigeration professionals at Young’s Cooling and Leasing. Preventative refrigeration maintenance is a good idea for saving money in the long run – not only will you save on utility bills now, but your refrigeration equipment will last longer and performance better over the years, so you can avoid the big capital expense of a new equipment purchase as long as possible. Preventative refrigeration maintenance is a specialty of Young’s Cooling – they know how to spot problems before they happen and keep your equipment in top running order year round. Young’s has found that most equipment failures are due to little or no preventative refrigeration maintenance. Often refrigeration equipment owners try to do preventative refrigeration maintenance themselves, or simply ignore signs of wear and tear and increasing inefficiency. Finally, after putting off preventative maintenance for so long, their equipment eventually fails and they find themselves in bigger trouble without adequate cooling and refrigeration. The result? Hundreds or even thousands of dollars in equipment damage, ruined products, and lost revenue. Fortunately, there’s an easy answer – preventative refrigeration maintenance from Young’s Cooling. Their refrigeration techs are trained to identify problems, look for faulty parts and performance, and correct these and other problems before they cause a drop in refrigeration efficiency or, worse, failure. 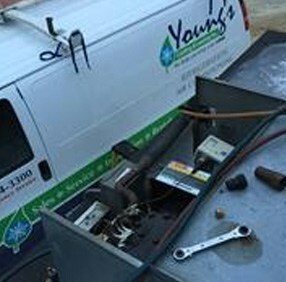 If you’d like to know more about preventative refrigeration maintenance in the surrounding communities of central Massachusetts, contact the refrigeration specialists at Young’s Cooling and Leasing.